Anyone who has bought a textbook, whether during college or graduate school, understands how expensive they can be. College textbook rental startup BookRenter is trying to make the process of buying textbooks more affordable through its online site which loans books to students for a fixed duration. Today, the startup is opening up its platform to other sites to allow any college or business to launch its own online textbook rental store. Competitors Chegg and Barnes & Noble College are pursuing similar partnerships. 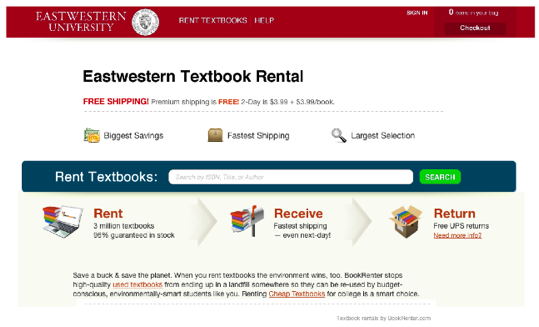 Partners, such as universities or campus bookstores, will be able to use BookRenter to set up a virtual store on their sites. Partners have access to the same selection of textbooks available on BookRenter’s site (which are electronically sourced from the largest textbook supplier)s. Partners can also use BookRenter’s dynamic pricing engine, which updates textbook prices in real time by responding to shifts in market supply and demand, as well as its customer service support. And BookRenter offers partners analytics platform and on-demand reporting capabilities, to give them intelligence on what’s selling. BookRenter allows partners to take 8% of the rental price. The site currently has 3 million titles and and promises to rent books for 75% off the list price of the textbook. The expansion of BookRenter’s platform to other sites makes sense for the startup to expand its userbase. But, 8% is a low cut for a partner and many campus bookstores may see the rental platform as competition for their own textbook sales.